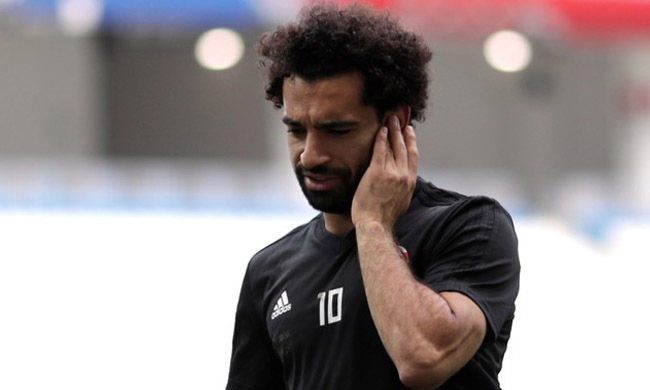 An Egyptian Football Association (EFA) spokesman played down a CNN report saying Mohamed Salah was contemplating international retirement, insisting the star forward has not made any such references. Citing a source close to Salah, CNN said earlier on Saturday that the Liverpool forward was "considering quitting the Egyptian national team due to his unhappiness over what has happened in Chechnya". The 26-year-old caused a storm after Chechnya leader Ramzan Kadyrov gave him an honorary citizenship as the strongman ruler hosted a dinner for the Egyptian national team on Friday. The Egyptian team has used Chechnya as a training base during their first World Cup appearance in 28 years. They exited the tournament after two defeats by Uruguay and Russia in Group A but still have a game to play against Arab Gulf side Saudi Arabia in Volgograd on Monday. "Salah feels exposed by what has happened in Chechnya. The Liverpool star doesn't wish to engage in topics beyond football or to be used for anyone's political image," the source told CNN. Osama Ismail, an EFA spokesman who is with the team in Russia, implied that the CNN report was not credible. Neither Salah nor his agent commented on the report, which went viral in the football-mad country. "Salah hasn't informed the Egyptian delegation of anything CNN had talked about. No comments should be taken from Salah except what is written on his official Twitter account," he said on Twitter. The former AS Roma man missed Egypt's opening 1-0 loss to Uruguay due to a shoulder injury but played in the 3-1 defeat by Russia last week, scoring the Pharaohs' only goal from a second-half penalty. Salah, who is also expected to face Saudi Arabia in Egypt's final Group A game, netted 34 goals in 58 international appearances.